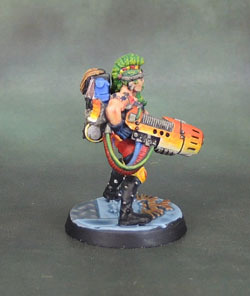 Necromunda! 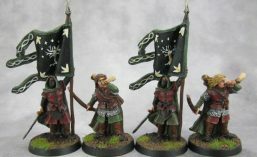 – Escher Leader & Heavy updated (Fembruary Painting Challenge 2018) | Azazel's Bitz Box. 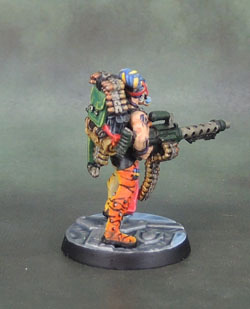 This entry was posted in Necromunda and tagged Escher Gangers, Necromunda. Bookmark the permalink. Nothing wrong with a splash of colour in my book. It’s all good – my choices were a little more unleashed back in those days as I hadn’t quite learned the value of a more limited palette. 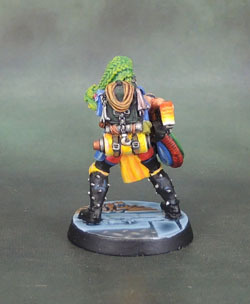 I never have to paint brightly coloured figures, but if I did I’d want them to look this good! Thanks mate – I appreciate it! I can taste the rainbow… oh hang on that’s kinda creepy in this case haha. They’re awesome man. I’m not usually a big fan of bright colours but these work really well. Heh – thanks Alex. 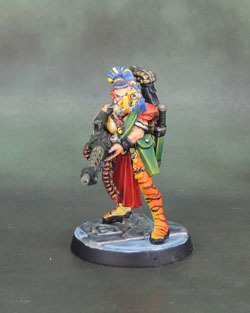 There’ll be more tiger-footing around in the future! Those tiger pants are amazing! From what I’ve seen, Escher are pretty vibrant, so I wouldn’t worry. 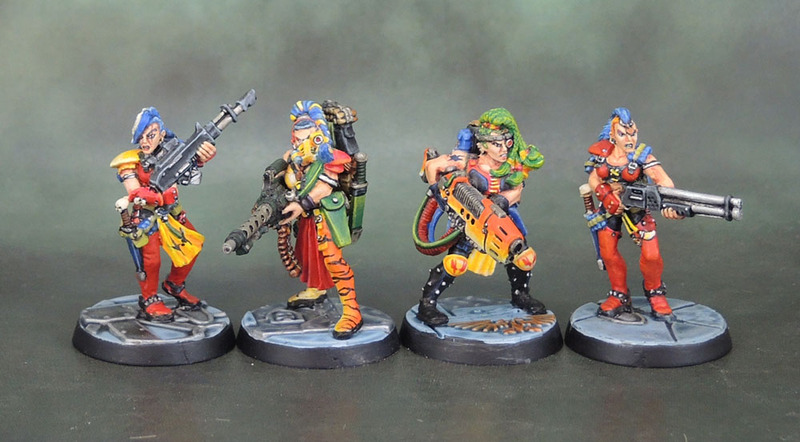 Escher outfits remind of crazy glam party girls (and boys) from the 80s. 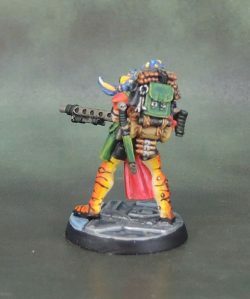 I can’t really tell from the pics, but the bases seem to be painted in different colors in different spots. At first I thought you were using this to denote firing arcs, but it doesn’t look like that is the case. Just different floor materials, perhaps? 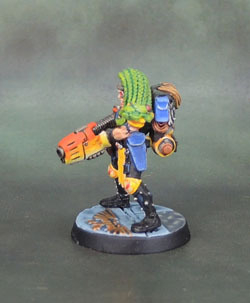 The new Necromunda also has firing arcs. They include different sized tokens to represent this. 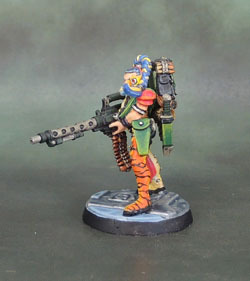 I think there might be mention in the rules of painting the figure’s base to designate a firing arc as well. Ah. I’ll have to add in something subtle but visible. Probably a mark at the absolute rear of the base. Excellent! 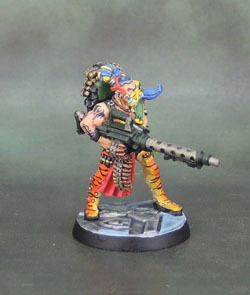 The old Escher Heavies are a couple of my all-time favourite GW Models. 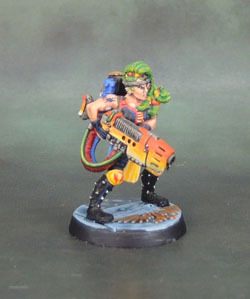 I would also say that, for Necromunda stuff, and particularly Eschers, ridiculously bright colours actually work out pretty well. My own new Eschers are actually brighter than the ones I did back in the 90s. Yeah, I do look forward to doing some all-new figures and seeing what I feel like doing with them once the final few started-but-unfinished ones are out of the way. 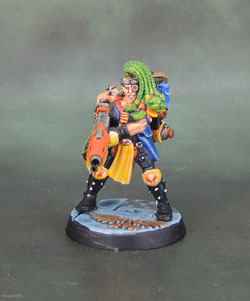 Do you have a link to your original Escher models? Thanks! They were a pair that certainly did their share of messing people up back in the day. Great colors, I am reminded of seeing the youth of Frankfurt in 1982, I think I saw these chicks there…now they are grandmothers! Nice work AZ!